In the past 5 years, SmallWorld Cambodia has supported close to 70 startups, some of which have been extremely successful. These startups include Cambodia’s first ever 3D printing company ArcHUB Phnom Penh, award winning startup BookMeBus, Sky Architects and CodingGate, all of which have been featured in some way on Geeks in Cambodia. 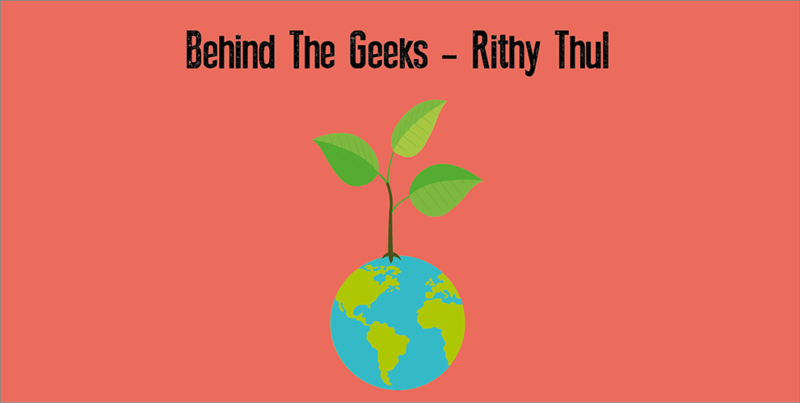 Given its active role in the scene, we felt that the Behind The Geeks series simply would not be complete without catching up with the founder of SmallWorld, Rithy Thul. If you’re thinking that Rithy is quite a familiar name, well, it could be because he’s also one of the founding members of Emerald Hub and Comm.On. To find out more about SmallWorld’s plans for 2017 and his story, we sat down for a chat with Rithy (R). Thanks for taking the time to be interviewed. Let’s chat a little about you first, what inspired you to get involved in Cambodia’s startup scene? R: I’m someone who always loves being on the go, who loves working on a project without a definitive plan but yet, always knowing that something exciting is happening. So about 5 years ago, I started to realise that there were a lot of young people who were slowly getting interested in Tech and they wanted to explore the field but did not have a place to work. From there, we wanted to set up a place that people could feel at home working at, that was not a coffee shop. Slowly, more and more young people started to use the space and they had fun while working there. I think it’s because they go to school, they learn, but they are restricted in terms of what they could explore. As such, we opened up SmallWorld to be a free space for people to be whoever they want to try to be, away from any resistance that adults might have. This caught on really well and many young people who are into art, technology, design and various other creative projects started to use the space. For me, seeing so many young people having a chance to do what they want to do was one of the happiest times of my life. How do you define the role you play in the startup scene? R: I think the role we play can be split into three parts. The first, we hope that we are an inspirational machine. That young people who want to do things that aren’t really status quo can look up to startups who have worked with us and realise that they are on a path that has already been chartered. The second, is that we don’t really represent a lot of money, but we represent a lot of effort put in and the curiosity of the mind. Finally, we represent that it is ok to be yourself, and ok to be different. After working in the scene for so long, what would you say a thriving entrepreneurial scene looks like? R: I think it would be when a lot of young people are exploring the unknown to try and solve problems. And by that I mean, not just going with the flow and coming up with a new app to solve problems like a lot of people are doing, but to approach the problem from a different angle and developing a solution that is directly suited to the problem. Aside from that, I think entrepreneurs in Cambodia can also benefit from having more support from policy makers. I think they are moving towards the direction that entrepreneurs need but it’ll be great if they could move faster such that legislation can help close the gap between entrepreneurs and investors. Then, we can see more solutions being developed at a faster rate. Could you give us a little preview into what Smallworld has in store for aspiring entrepreneurs next year? R: Next year, SmallWorld will be focusing on the internal technology startups, especially those related to FinTech, like payment technologies as well as hardware technology. On top of that, SmallWorld also has a small business team who support startups by matching and handholding startups to help them move from the ideation phase, to developing a business model, to customer acquisition to hopefully, generating a sustainable revenue stream. We’re also looking to bring the core team that is focused on technology development out to the coastal city Kep to see if we can work remotely from there. What we hope to achieve with that is that they can have a place to focus with good internet, a good living environment and the potential to explore nature around them. With that, it does also mean that we are currently exploring the possibility of opening a space in the mountains to provide an escape for entrepreneurs who have an office space in the city but would like to get away for a week. When they are working remotely, it can be a sort of retreat for them as well, which is what SmallWorld really wants to help them do – have a bon fire, sleep in a tree house, go cycling and meditate on the sunrise. That sounds really cool. One last question, after working with entrepreneurs for so long, what would be your advice to them? R: My advice would be to take more action, make more mistakes and keep learning. From my experience, I can say that these steps will be your best bet to achieving success in the entrepreneurial world. Another thing would be not to fall back on the same mistakes and don’t learn too much. I think sometimes when people start knowing too many theories and reading too much from books, they get scared because they see thousands of problems ahead and refuse to move from the position they are at. So really, make mistakes, learn from them and know that there is a real difference between constantly educating yourself and learning along the way, as compared to simply going to school. Wise words indeed from startup guru Rithy Thul. If you’re an aspiring entrepreneur, hopefully SmallWorld’s plans for 2017 will get you all excited for a getaway to really focus on your startup (and a week in a tree house!). We hope you’ve enjoyed this edition of Behind The Geeks. Join us next week as we sit down for a chat with Be Chantra, the man behind Startup Weekend and BarCamp.